The natural immunity that a mother passes onto her baby starts to decrease soon after birth. A baby’s immunity to whooping cough and chickenpox, for example, is said to decrease naturally by the age of 3 months and measles by 1 year. After this period your baby’s immune system will start to produce his or her own antibodies. Vaccination is important to help protect your baby against illnesses. There are two kinds of vaccinations: routine vaccination and non-routine vaccination. Routine vaccination is free of charge if you receive it during the period designated by law. Please take your boshi-techo (mother and child health handbook), the booklet for vaccinations and your health insurance card to the health center or hospital where you intend to have your child vaccinated. We need to confirm your baby’s name, address and date of birth. Before your baby is vaccinated,you have to fill out the questionnaire from your booklet for vaccination and submit it. After your baby is vaccinated, a member of the health care staff will register it in your boshi-techo. Make sure to have the information filled out in your boshi-techo, whenever your child is vaccinated. 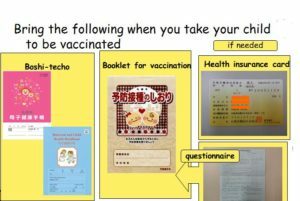 Ask your doctor to write a document of your children’s vaccinations in English, for future use before you leave Japan. You might need a few days to get the document. The processing fee of the documentation is about 2,000 to 5,000 yen, depending on the clinic. Nobuko Kawamata M.D. You can have BCG at health center only. Your baby needs BCG once at 5,6 or7. We usually give BCG at 5 months of age. Other routine vaccinations such as DTP-IPV, Hib, PCV(pneumococcal vaccine 13), MR and German measles are available at clinic. You do not receive these notifications so you have to make your schedule on your own. You can ask your doctor or health center for scheduling. You have to pay for vaccination for seasonal flu or mumps. Charges may vary clinic to clinic. Please confirm in advance because some clinics may require appointments.